The Stock Exchange of Hong Kong (the Exchange) has published amendments to the Listing Rules which will take effect on 1 July 2014. The amendments implement changes to the rules on connected transactions in Chapter 14A (GEM Chapter 20); revise the definitions of "connected person" and "associate" in Chapter 1; and apply the Chapter 14A definitions of connected person and/or associate to other areas of the Listing Rules (Rules). New FAQ Series 28 (see archive) on Rule Requirements Relating to Connected Transactions which take effect on 1 July 2014. The Exchange has also published new Guidance Letter HKEx-GL73-14 (see archive) on pricing policies for continuing connected transactions and their disclosure. The following provides a summary of the Rule changes and the guidance given in the new Guidance Letter. References to the Listing Rules are to the amended Rules. Align the auditors' confirmation on continuing connected transactions with HKICPA Practice Note 740.
other Rules where the use of the Chapter 14A definitions of connected person and associate are corollary to the connected transaction requirements. In order to simplify the language of the connected transaction rules, the current Chapter 14A (GEM Chapter 20) will be replaced by the Guide on Connected Transaction Rules issued in April 2012 (currently set out in Guidance Letter HKEx-GL70-14) (see archive), with modifications to take into account drafting comments from respondents to the consultation. the issuer's independent non-executive directors (INEDs) confirm that the terms of the transactions are fair and reasonable, and they are on normal commercial terms and in the interests of the issuer and its shareholders as a whole. In the diagram below, Mr. X, as a director or substantial shareholder of the issuer's subsidiary, is a connected person of the issuer. Subject to meeting the above conditions, transactions between the issuer group and Mr. X will be exempt from the shareholders' approval requirement. The Listing Rules currently exempt transactions between the issuer group and persons connected with the issuer's insignificant subsidiaries, subject to a 10% restriction on the consideration test for any capital transaction between an insignificant subsidiary and the person connected with that subsidiary. An "insignificant subsidiary" is a subsidiary of the issuer whose total assets, profits and revenues are less than: (i) 10% under the percentage ratios for each of the three preceding financial years; or (ii) 5% under the percentage ratios for the latest financial year. The Rules will be revised to exclude all persons connected with the issuer's insignificant subsidiaries from the definition of connected person, rather than exempting transactions conducted with these persons. 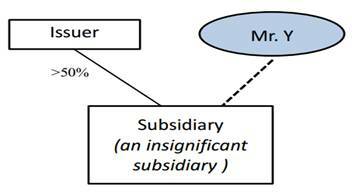 In the diagram below, Mr. Y is a director or substantial shareholder of the issuer's subsidiary. Mr. Y will not be a connected person of the issuer so long as the subsidiary is an insignificant subsidiary. The current definition of "associate" includes the trustees acting in the capacity as trustees of any trust of which a director, chief executive or substantial shareholder (or, if such person is an individual, any of his immediate family) is a beneficiary. the connected persons' interests in the scheme are together less than 30%. Under the Rules, the definition of "associate" includes an entity in which a connected person has a 30% or more direct or indirect interest. However, the Rules exempt an entity from being treated as an associate if the connected person holds an interest in the entity only through his/its shareholding in the issuer. In the diagrams below, neither Company A nor Company B is an associate of X because X's direct interest is less than 10%. Under the current Rules, connected transactions include any acquisition or disposal of interests in a target company in the circumstances described in current Rule 14A.13(1)(b) where each of the issuer and its controller is, or will be, a shareholder of the target company. A "controller" is a director, chief executive or controlling (>30%) shareholder of the issuer or any of its subsidiaries. The amendments remove the 1% cap on transaction value, which is one of the conditions for the exemption of an issuer's provision or receipt of consumer goods or services to or from a connected person (Rule 14A.97). the indemnity/insurance is in a form allowed under the laws of Hong Kong, and, where the company providing or purchasing the insurance is incorporated outside Hong Kong, the laws of the company's place of incorporation. For example, if under the terms of a director's service contract, a listed company will indemnify him against liabilities arising from negligence, default and breach of duty by the director, the listed company will not be able to rely on the new exemption for directors' indemnities because the Companies Ordinance does not allow a director to be indemnified against negligence, default or breach of duty. Nor can the listed company rely on the existing exemption for directors' service contracts under Rule 14A.95 in respect of a director's indemnity or insurance which is not exempt under Rule 14A.91 or 14A.96 (FAQ 19 of FAQ Series 28). The revised Rules clarify that the independent board committee on a connected transaction must also advise whether the connected transaction is on normal commercial terms and in the issuer's ordinary and usual course of business. The Rules relating to auditors' confirmations on continuing connected transactions have been revised in line with Practice Note 740 issued by the Hong Kong Institute of Certified Public Accountants. An issuer which entered into an agreement for CCTs before 1 July 2014 can apply the exemption for the reporting or annual review requirements in their next annual reports provided all the exemption conditions under the relevant new/revised Rules (e.g. the transactions have a total value of less than HK$3 million and are therefore fully exempt under the revised Rules). It should however announce that it will apply the exemption to these transactions, and the reporting or annual review of the transactions will not be required in the next annual report (FAQ 25 of FAQ Series 28). Chapter 1 of the Listing Rules currently contains the general definitions of "connected person" and "associate" which are wider than those used in Chapter 14A for the purpose of the connected transactions requirements. extended associates: extended family members of a connected person who is an individual. These include any person cohabiting with him as a spouse; his or his spouse's children aged 18 years or above; his parents; his siblings; and companies controlled by them. There is no change to the definition of "associate" of a connected person that is a company. Extends scope of reverse takeover Rules to cover acquisitions from the incoming controlling shareholder's extended family members and companies controlled by them. These acquisitions are also connected transactions. GEM Rule 19.91 Restriction on disposal of an issuer's existing business within 24 months after a change in control unless the assets acquired from the person(s) gaining control and his/their associates and any other assets acquired after the change in control can meet Rule 8.05. The revised Rules rename the definition of "connected person" and "associate" in Chapter 1 as "core connected person" and "close associate", respectively. "Framework agreement" - setting out the framework within which a series of CCTs are to be conducted over a period. The actual terms of each transaction would be negotiated on a per transaction basis. The consideration for individual transactions may be subject to pricing guidelines or based on a range of parameters, a majority of these agreements require the transactions to be conducted at market prices. The agreement will provide for the terms of individual transactions to be negotiated on an arm's length basis. the frequency of update to the reference price. The procedures for obtaining quotations or tenders from the connected persons and a sufficient number of independent suppliers, the assessment criteria and the approval process. For example, the management would solicit at least two other contemporaneous transactions with unrelated third parties for products in similar quantities to determine if the price and terms offered by a connected person are fair and reasonable and comparable to those offered by unrelated third parties. "The transaction shall be priced in accordance with the following terms: (i) government-prescribed price; (ii) where there is no government-prescribed price, the government-guidance price; (iii) where there is neither a government-prescribed price nor a government-guidance price, the relevant market price; (iv) where none of the above is available or applicable, the price to be agreed between the parties which shall be determined on the basis of reasonable cost plus reasonable profit margin and by reference to the historical price." The Rules require issuers' auditors to report annually on CCTs. Auditors may refer to Practice Note 740 "Auditor's Letter on Continuing Connected Transactions under the Hong Kong Listing Rules" issued by the Hong Kong Institute of Certified Public Accountants for guidance as to their responsibilities and procedures when undertaking the annual review.